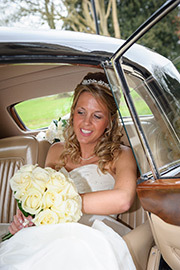 We have been providing classic wedding transport in Bristol, Bath and parts of Somerset and Wiltshire for over eleven years. Whether a church wedding, or a civil marriage with the ceremony and reception within a single venue, every couple's day is unique and our experience and service always individually tailored to you. We want you to relax, knowing that there is no risk that your wedding transport can be delayed by a late-running booking elsewhere, and to take your time with your guests, certain that we are not anxious to rush-off. 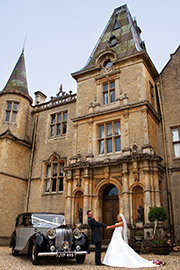 De Gournay Wedding Cars are proud to be a recommended wedding transport provider to many venues, including Coombe Lodge, Wick Farm Bath, Priston Mill, The Assembly Rooms and the Roman Baths & Pump Rooms. On the day, your fully-uniformed chauffeur will arrive with you at least half-an-hour before your first journey is even due to begin – Plenty of time for a final polish of the car and any photos prior to the off! Leaving from very close to your place of ceremony? We know that the journey for the Bride and the person giving her away is very special family moment and where appropriate, we shall be pleased to take "the long way round" so that the two of you can enjoy a little longer to relax - Perhaps sharing a few precious memories and maybe a little parental wisdom before the ceremony begins! Where timings will allow, we shall be pleased to include an additional run/s for the Bridesmaids and Bride’s Mother, before returning for the Bride. Where additional vehicles are required, we can also offer current-model Mercedes-Benz S-Class Saloons and V-Class Luxury People Carriers, the latter seating upto seven passengers. 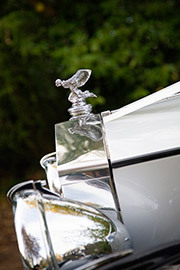 Finished in Silver to match our classic fleet, they are ideal where distance does not allow an additional journey to the ceremony, or where there are a larger number of Bridesmaids or family members travelling. Your chauffeur will be friendly and experienced, and will do everything so that you arrive calm, relaxed and at the right time. With over ten years experience, we are very familiar with most local churches and wedding venues, understand what works well for your photographer, and are always there to assist with your graceful entry and exit from the car. During the ceremony, we will ensure that the car is immaculately presented for your return, and positioned to best allow your guests to gather around for your departure. 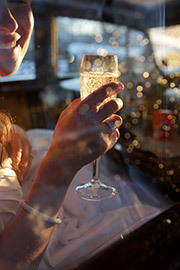 When the time comes to leave for the reception venue, a chilled bottle of Prosecco or Non-Alcoholic Sparkling Grape Juice await the newly married couple as a gift, along with complimentary Bottled Water, Canned Soft Drinks and Chocolates. Traditionally you will be the first to leave the ceremony, but to allow your guests to travel to the reception in advance of your arrival, we will happily extend your route. 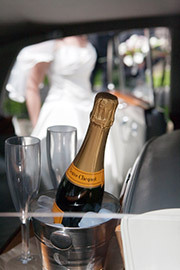 This is a great opportunity for the Bride and Groom to enjoy a few moments together and catch your breath! A very popular choice is to make a photostop en-route, adding to the fun of the day. Perhaps your ceremony and reception are at the same venue? - Once you are married, why not enjoy a few moments together by letting us take you on a short drive? Not only does this give the Groom a chance to travel in the car, but you both have a little quiet time to yourself before re-joining your guests. If there is a location for a photostop nearby, then we would be delighted to include this. Throughout the day, we will work with your photographer to see that all of your memories are captured, and only when these are completed, will we depart. Should the Bride and Groom wish to have additional prestige transport at the end of the evening, we can offer the luxurious, state-of-the-art current-model Mercedes-Benz S-Class. 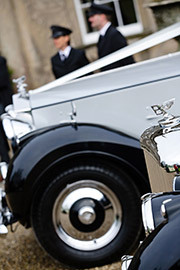 From our friendly, experienced uniformed chauffeurs, to the presentation of our cars - Our commitment is to provide the highest levels of personal service, to make your wedding transport just perfect. Or simply give us a call on 01761 451142 - We would love to hear from you! De Gournay Wedding Cars cover the following areas; Bristol, Bath, Wells, Frome, Shepton Mallet, Bradford on Avon, Warminster, Trowbridge, Radstock, Midsomer Norton, Bruton, Cheddar, Yate, Thornbury, Portishead, Clevedon & the East Somerset area. For a internet directory of wedding services in our area, County Bride offer links and advice to assist you in your wedding plans.